A recent photo of our Oak Grove facility in Waukegan, IL. 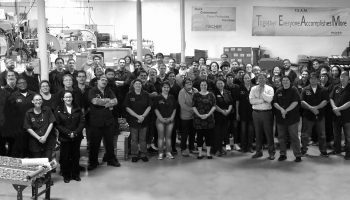 The Fischer team on the manufacturing floor at the Ida Avenue facility in 2016. Fischer Paper Products is a successful, stable, and respected supplier to the foodservice industry specializing in providing quick, customized paper packaging solutions. 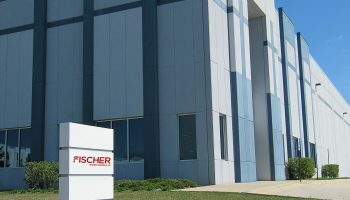 For more than 40 years, the Fischer team has worked with fanatical effort to meet our customers’ needs for reliable service, quality product, and quick order turnaround. At Fischer, we believe that honesty is the foundation of trust and always strive to be collaborative, mindful, personal, and responsive both within our internal teams as well as with all our external customer relationships. We pride ourselves and stake our reputation on superior quality, friendly and helpful service, short lead times, and prompt delivery of our products – it’s the little things we do to make things easier for our customers. Fischer Paper Products is positioned for exciting growth and innovation. Continuous improvement is the foundation of our growth, allowing us to serve our customers in ways that ensure long-term mutual success. We seek employees who strive to meet these standards in a safe and rewarding working environment. Fischer Paper Products offers a strong potential for growth, a business casual work environment, competitive wage commensurate with experience, an excellent benefits package including health, dental, vision, life, disability, vacation, 401(k) retirement savings matching contribution, and more. Fischer is proud to be an Equal Opportunity Employer. We also maintain a drug-free workplace and perform pre-employment substance abuse testing. Operate flexographic printing presses and in-line bag converting machines. Set up jobs with parts/materials such as paper, ink, glue, plates, formers, print cylinders, etc. Maintain and run machines according to job specifications. Check bags for quality, troubleshoot, and sign off on product. Daily and weekly cleaning and preventative maintenance of machines. Prepare and develop needed materials for SMED/ Kaizen events. Provide assessments, thoughts and recommendations as follow up. Provide support in creating reports for various Engineering & Maintenance related projects.